Biodynamic agriculture, which has consistently increased in popularity over the years, was born from a single course of eight lectures delivered by Rudolf Steiner in Koberwitz (now in Poland) in June 1924. 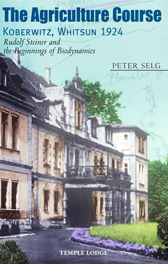 In The Agriculture Course Peter Selg presents an unprecedented study of the context within which the lectures took place, conveying a tangible sense of the celebratory mood and atmosphere of those Whitsun events. He highlights Steiner's intentions for the course - as well as the parallel lectures he gave in Breslau - by drawing widely on the available literature and numerous archive materials. Recognizing that chemical manipulation of agriculture was neither desirable nor sustainable, Rudolf Steiner helped launch an agricultural movement with a truly pioneering outlook. As Selg describes, Steiner saw that '...what was needed instead was new, conscious insight into life forces and laws, into the nature of organisms, into the diverse realms of nature, and the determining factors of both earth and cosmos that influence them.' The vivid picture painted here reveals the importance Rudolf Steiner placed on launching this work, and the extent to which his initiative offered an answer to the emerging forces of cultural and political destruction that would lead to the Second World War. PETER SELG was born in Stuttgart in 1963. He studied medicine in Witten-Herdecke, specializing in paediatric and adolescent psychiatry and psychotherapy. He is the Director of the Ita Wegman Institute for Basic Research into Anthroposophy in Arlesheim, Switzerland, and Professor of Medical Anthropology at the University of Art and Society in Alfter, near Bonn. The author of numerous books on the humanities, anthropology, medicine, education and biographical history. Peter Selg is also involved in extensive teaching and training activities and the management of public archives, and holds the post of Research Associate at the College of Humanities in Dornach.